A week ago death visited our quiet neighborhood without warning. It was at the end of a sunny and peaceful summer day. I had just finished cutting the lawn and was inside cleaning up. 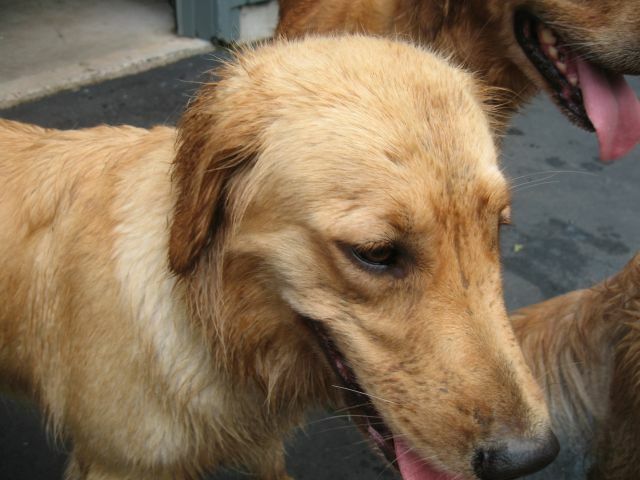 One of our neighbors came rushing up to the door and said her golden had just stopped breathing. 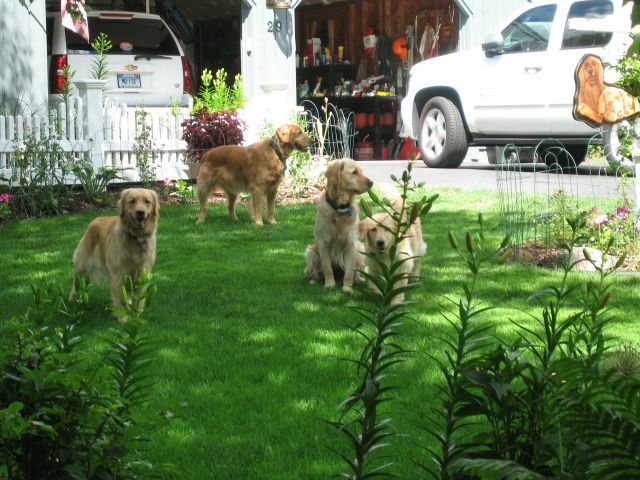 We rushed back to her front yard where her five year old golden, Maggie ( one of our Abby’s pups) had just collapsed. We immediately began CPR. 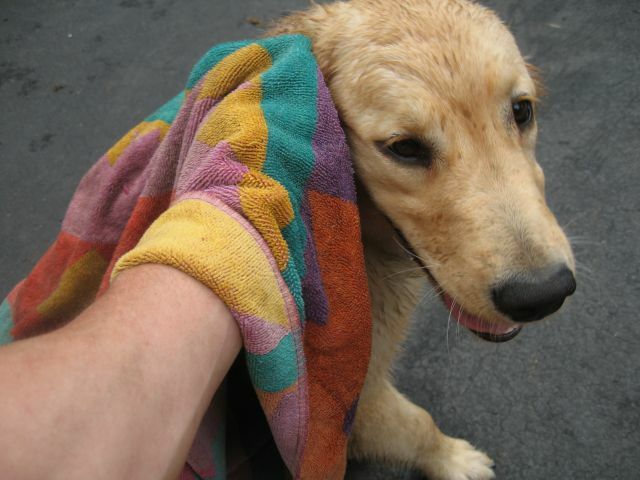 put her in a car, and made a frantic rush to the nearby animal ER in Avon. Unfortunately the kindly vet working there said there was nothing that she could do, and that Maggie had died. 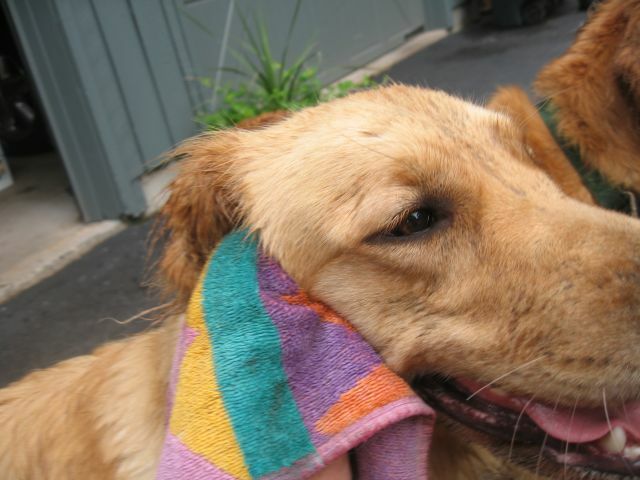 Maggie had been watching a group of neighborhood children play basketball in her front yard, and suddenly fell over. She had been in excellent health until that moment as best as anyone knew. 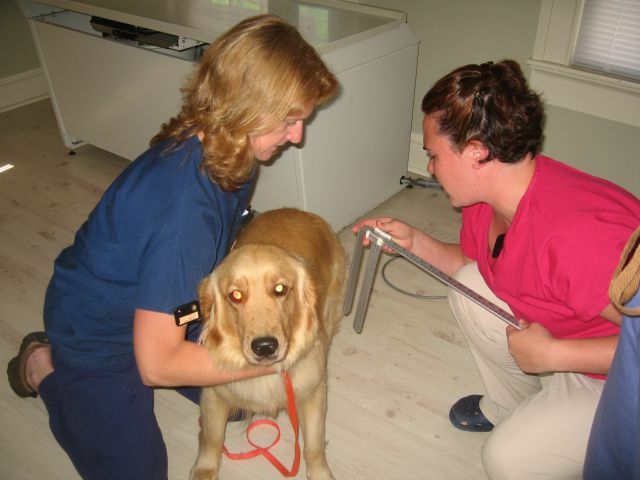 The vet surmised that it most likely was a ruptured aneurysm of the heart or brain. The shock to the family and and children over the loss of their first dog without any warning was terrible to behold. There was no way any words of mine could soften this tragic blow delivered like a lightning strike. 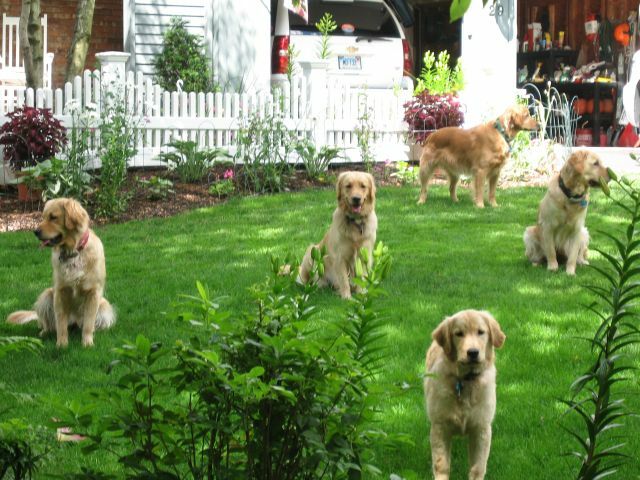 The intrusion of this harsh reality of life has shattered my image of our Mayberry village neighborhood filled with families and golden retrievers. 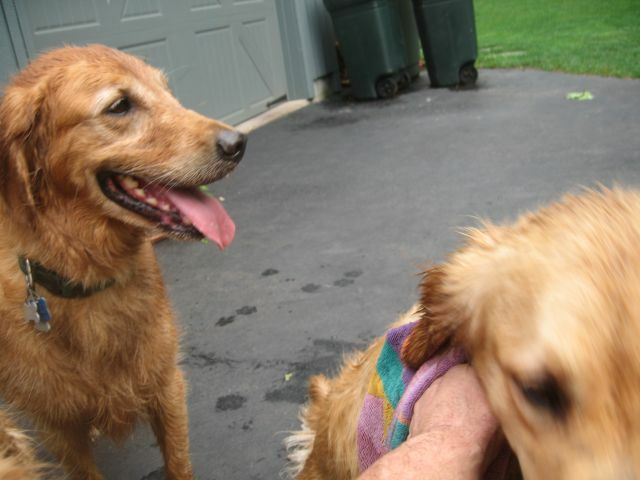 Our beloved Abby had blessed us with twenty seven puppies over three litters. Until last week, there were still eight of them living on our block or neighboring streets (excluding our five, made up of two of Abby’s daughters, and three of her grandchildren). 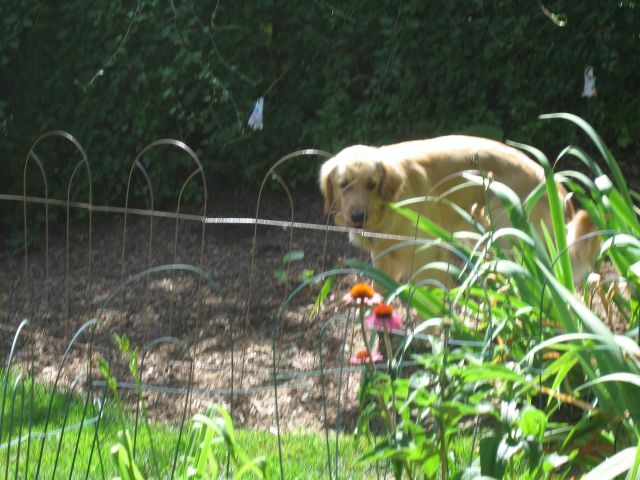 We had lost only one of her offspring so far to kidney disease at age 7, and that was my cousin Ron’s dog Emma (See Sad News) who lived in another town. Another of her offspring is battling lymphoma in another state, but is holding his own as far as my information goes. So we had been blessed with good fortune here until now. My sisters and I never had dogs growing up, but we certainly had an assortment of injured birds, hamsters, rabbits, and cats. I can remember burying some of them in our backyard, but can no longer recall the tremendous pain any child suffers when they realize for the first time that life is short, unpredictable, and finite, and that their beloved pet is gone forever. I saw that pain clearly etched in the face of the young teenaged neighbor who accompanied his mom and I to the ER that night, his golden companion wrenched from his happy life. 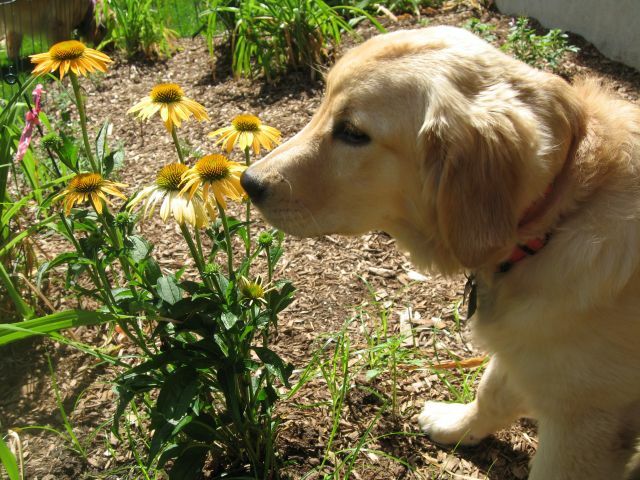 Due to our website, we now receive email letters from all over the country from folks who have lost their golden retreiver to age or illness. Most just want to express their grief, while others feel some bond with what I wrote about Abby and her message on our website. We also have many more folks on our puppy list waiting to replace lost goldens than we have new families wanting to get their first. I respond to all who write that I believe there is a steep price to be paid for all the years of love and loyalty that we enjoy with these amazing animals. It is not monetary, but it is instead the sadness and loneliness we feel at the end of their lives when we have to say goodbye. 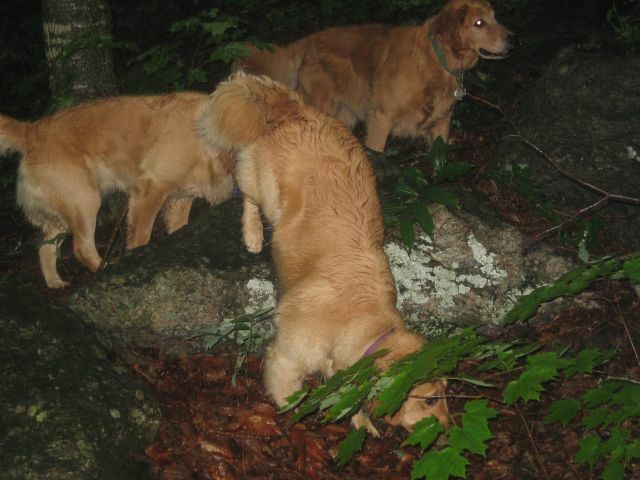 Still, having gone through the experience now six times personally, I remain convinced that the adventures we experienced and the new friends we made as a result of our kinship with these goldens have given us a fuller richer life. All those good times weighed against the terrible price that comes due too soon. 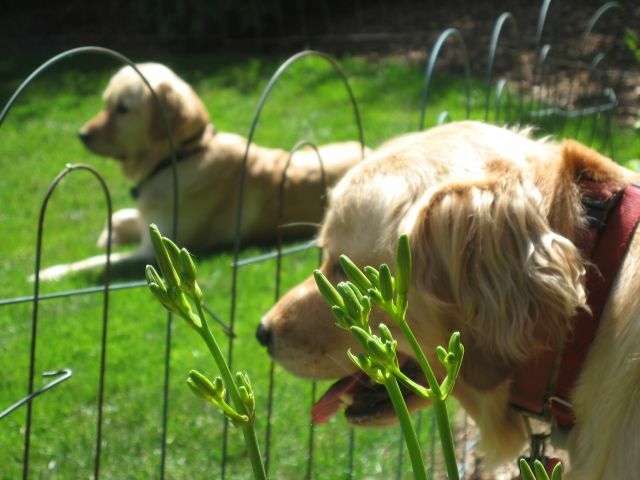 No one can predict when it will be time to stop grieving and get another golden. But your heart will know if you listen hard to its rhythm. Barb and I want to personally again offer our condolescences to our fine neighbors and friends, and their three children on their tragic loss. Out of respect to them I will share no photos of their beloved Maggie until they want that to happen or feel ready to share some of their own thoughts on their beloved companion. I would encourage all reading this to give your animals and family members who are close by, an extra hug tonight. None of us is privy to the fate that tomorrow’s sunrise will bring. Last week I had a some time off. We traveled to our modest mountainside cabin in Vermont. Of course we brought the “girls”. 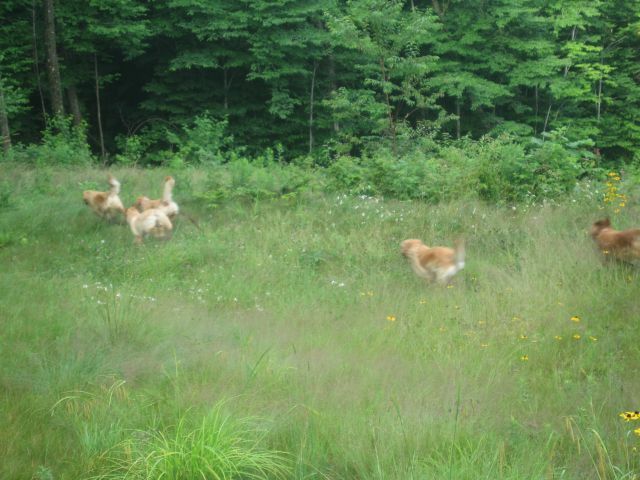 This was the first time that Lucy, our six month old, was going to the wilds of Vermont. 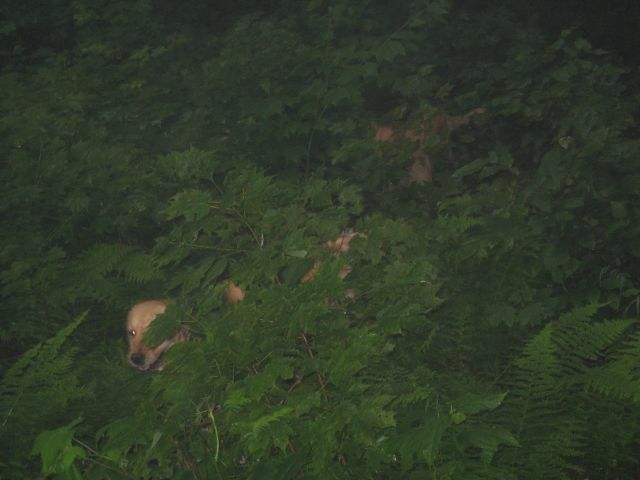 So five big dogs, three crates, and two vehicles made the uneventful drive to the peace and quiet of “Terrible Mountain” in Andover, VT. Mother nature rules there, as opposed to the suburbs of Farmington where human endeavors keep nature in check. I hadn’t been up there in a number of months. 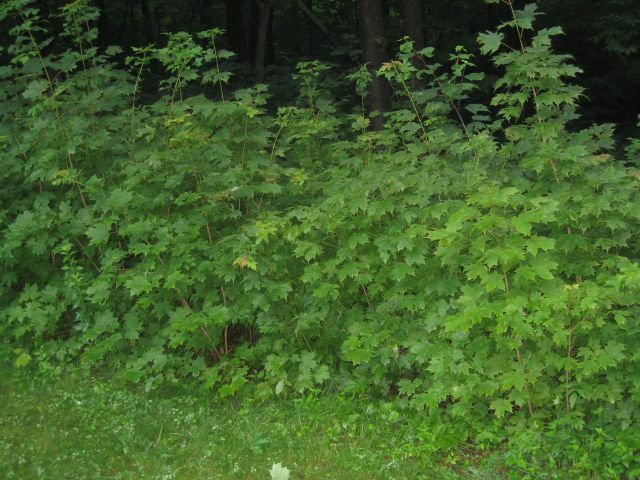 The foliage had really exploded and was encroaching on our small lawn and house signpost. The change from the prior two seasons when I was up there with some of the dogs was startling. 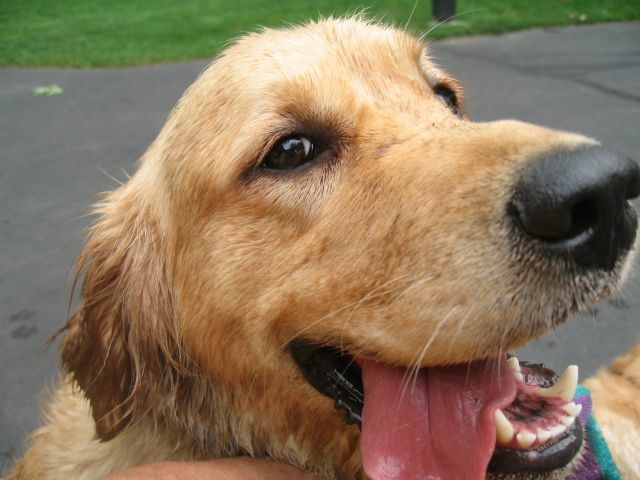 See the two prior posts for the visual changes: “Vermont Adventure“, “Water Dogs“. 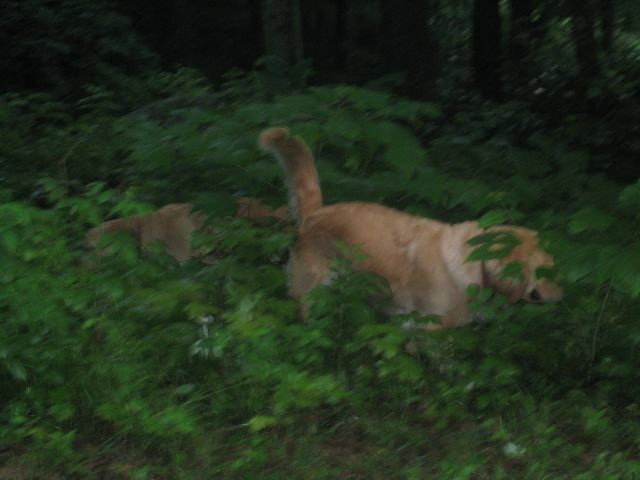 With the dogs anxious to explore, they pretty much disappeared into the jungle of green foliage. 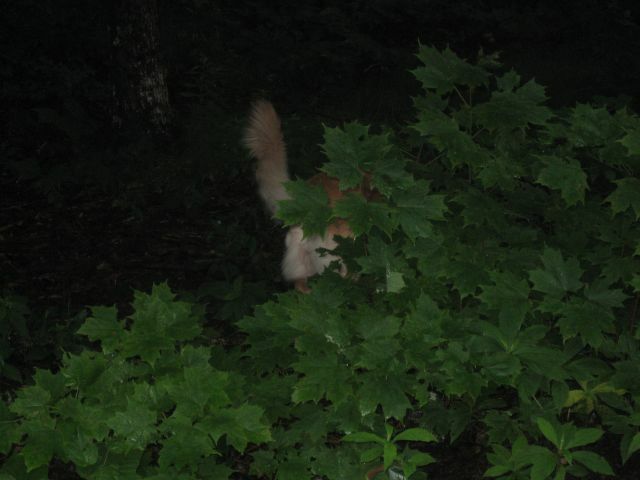 It was dusk when we arrived, and all I could see was a golden tail waving or flash of golden color moving in the dark green plant life. We also didn’t expect three days of pretty much steady rain interspersed with a few hours of damp weather. The tight quarters with wet dogs, and a puppy not fully trained, made for very little sleep. The new smells and different wildlife there kept the dogs excited. 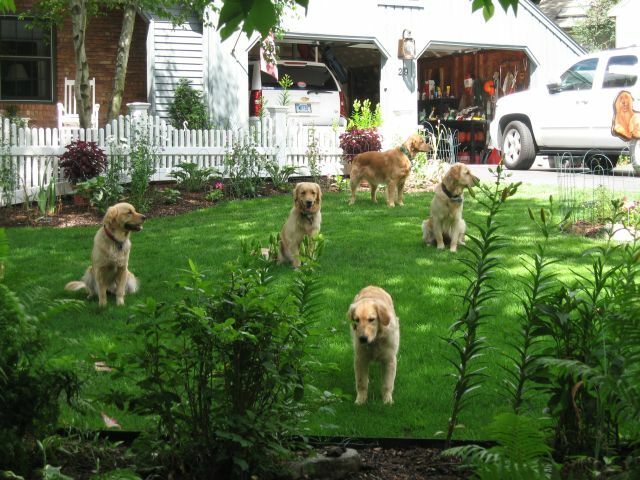 For the first time in my life, I felt that five goldens there was probably too much. Maybe it was the continued soggy weather or the dogfight in the dark in the middle of the night over who was going to sleep next to me, but Barb was frazzled, and we came home thankful for the returned sunshine and the space of our Farmington home. The dogs of course would have a different take on the trip. 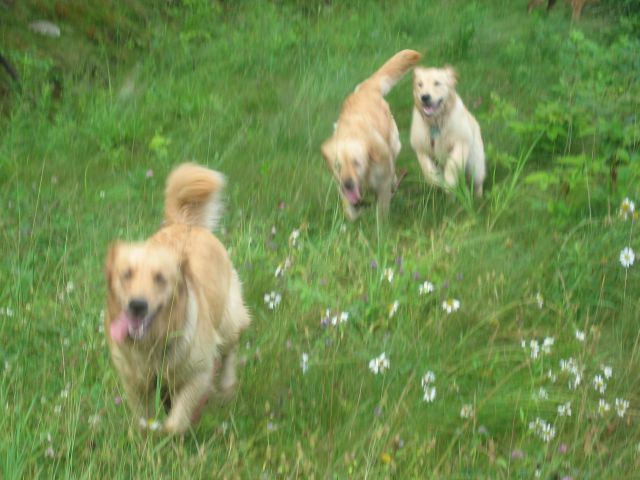 They loved the wet foliage, the run in the meadows, and daily run up the mountain road. As the summer progresses, some of our new flower beds have developed colorful changes. 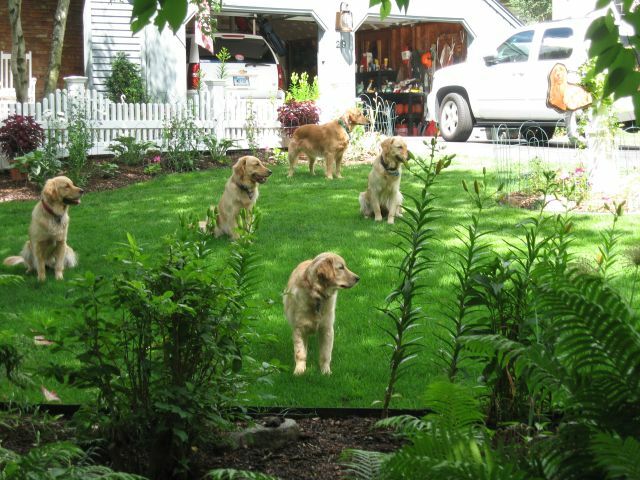 Our goldens are happiest when by my side, so whenever I am doing yard chores, they are very close by and make excellent company. But I also have to accept their canine nature to chew and taste anything that interests them. As you may have read before, most things with color and texture are fair game. (“Planting Flowers“, “Weeding Chores“). A little thing like fences doesn’t seem to stop them. 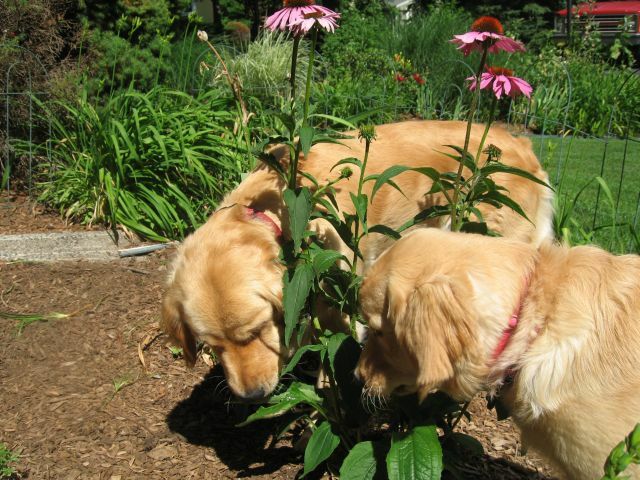 They seem to have a particular fondness for geraniums, coneflowers, and daisies. 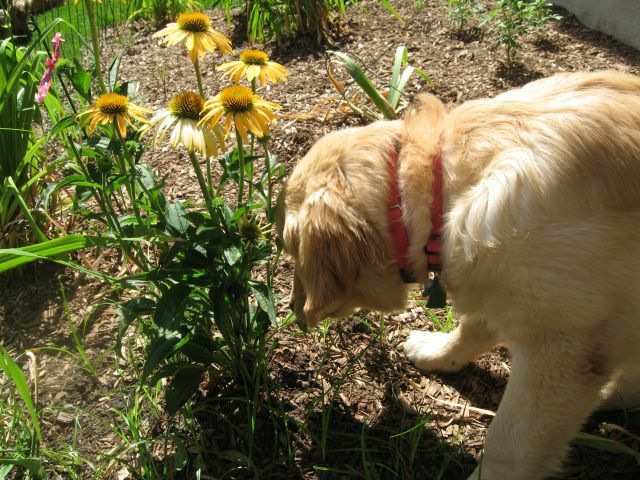 Of course humans also use ecchinacea for herbal remedies, which comes from the coneflower family. So the dogs may know something about herbal health that we don’t. Solo has also taken a personal interest in the few pumpkin plants that I grew from seeds. I planted five different kinds of pumpkins, but only three plants of one kind came up. 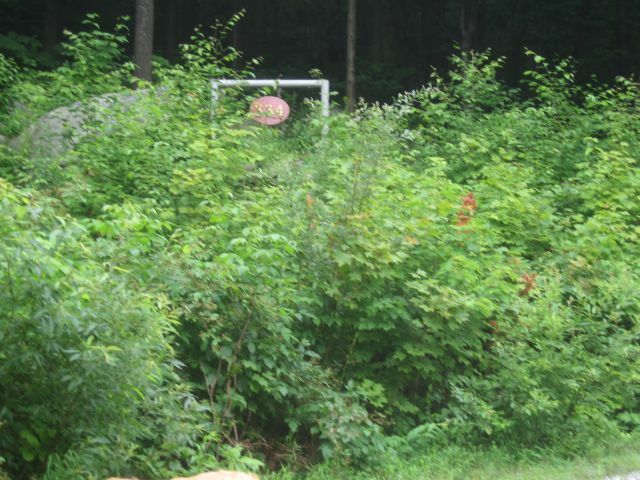 So my vision of a large Charlie Brown pumpkin patch this fall has gone the way of many another summer dream. But as anyone who gardens seriously knows, you are always planning at least one year ahead in your mind. Will try harder next year a little wiser in the way of seeds. Breeding News: Today we had excellent initial news about Solo’s hips and elbows. 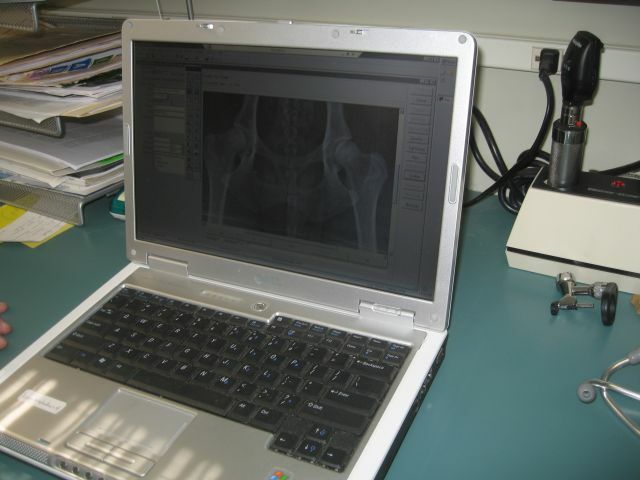 Dr. Steve Feldman took the required XRays on his machine, and using his new digital processor, we got to see the films on his laptop instead of the standard XRay viewing box. His wife and able assistant, Lisa, will then send the results by email. 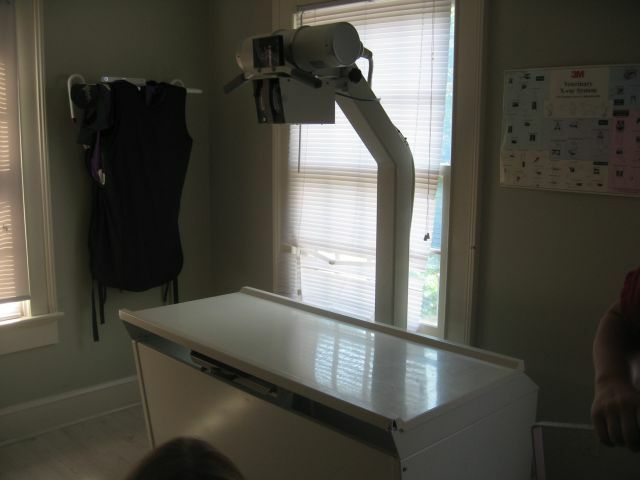 This saves the inconvenience of having large XRay films being handled and mailed to the Orthopedic Foundation. I was amazed at the security features Lisa explained that are in place with this digital email system. 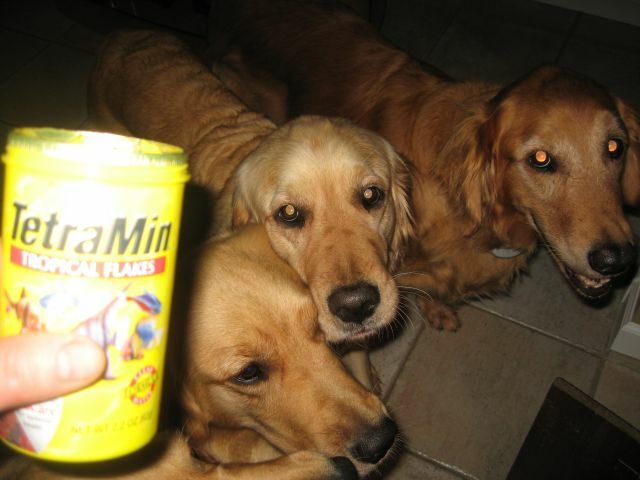 All to prevent fraudulent dog results from being certified. Because of my profession, I always assume folks are as honest as we are. Sadly, especially in the dog world, many are not I was told. 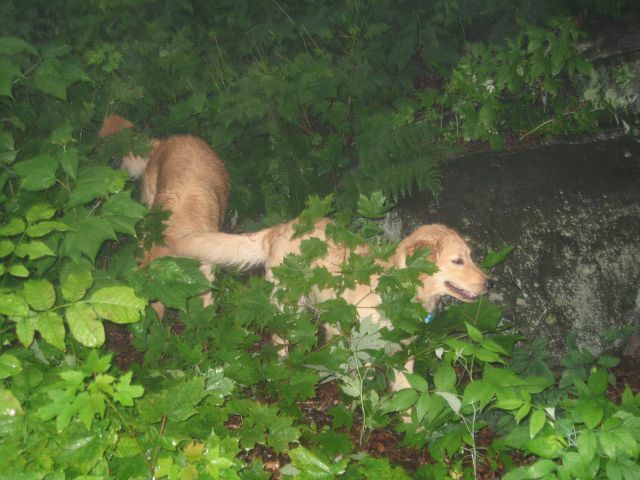 We will await the official report, but based on Dr. Feldman’s experience, it looks like Solo will join Emma and Riley as fully certified to be mothers of purebred golden pups. We still await the start of our Riley’s summer heat. Hopefully, any day now? 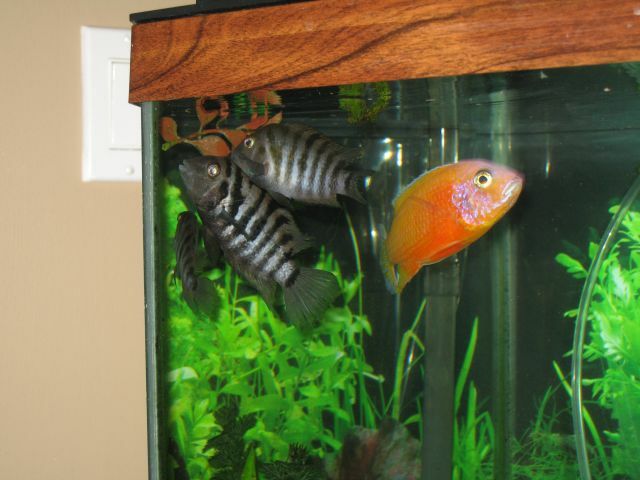 A while back I wrote a post about our fish tank and my efforts to bring peace and safety to the citizens of that watery world. 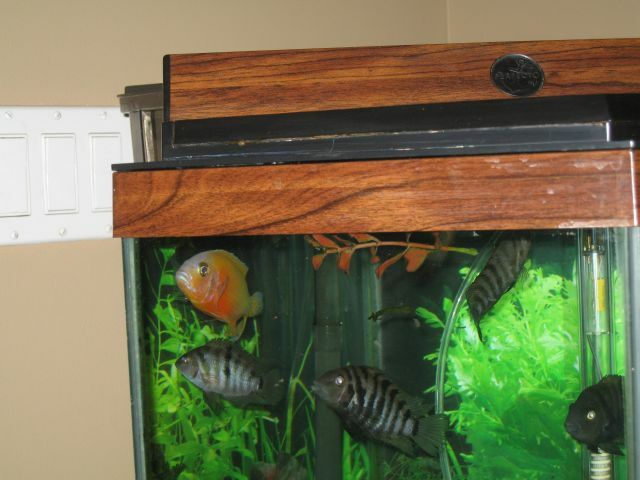 We’ve had this particular tank for over twenty years and you get fond of the fish that live sometimes for years under your watchful eyes. 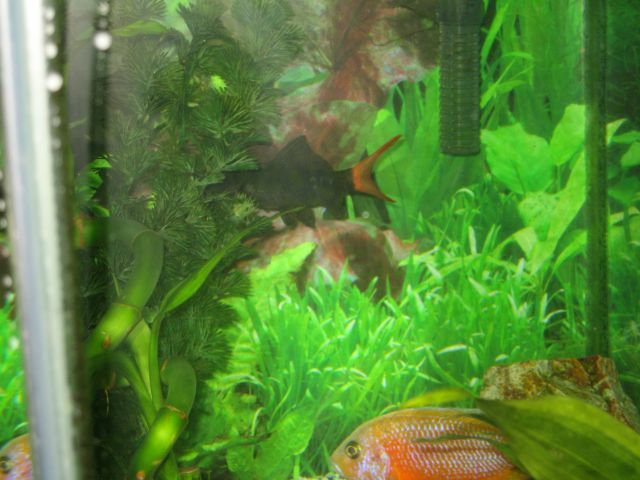 Our red tailed shark had become large and hungry, and was devouring anything of a smaller size that I added to the tank. See the post “Lucy Moments”. 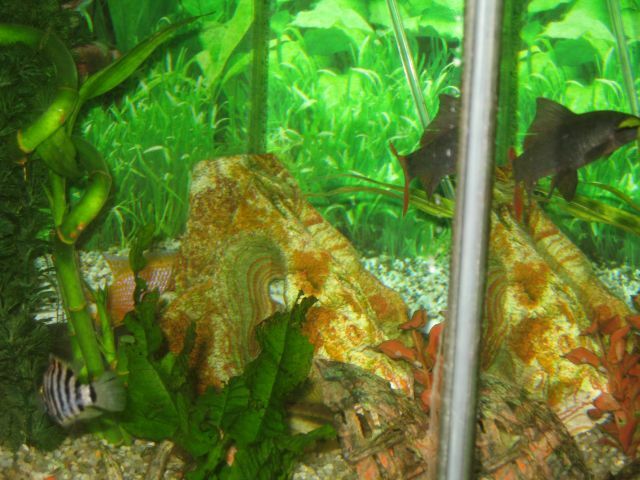 After speaking to an acquarium expert at a specialty fish store, I added what I thought would be the new godfather and his henchmen: a red “devilfish” and a group of striped fish called “convicts”. The plan worked but not in the way I expected! 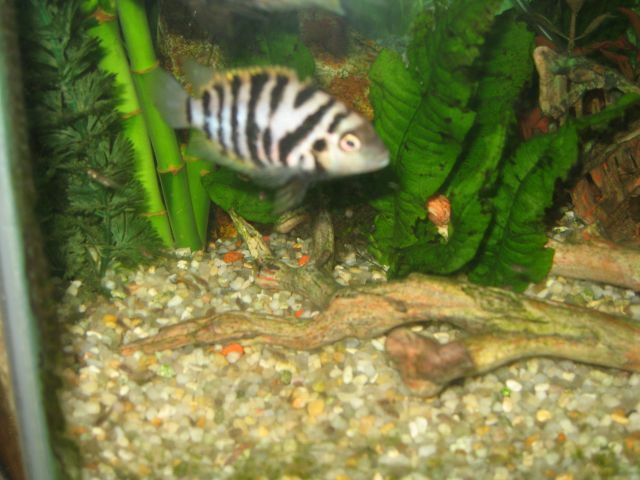 We have not lost a single fish since adding the larger species from South Africa and Central America. The red tailed shark has become complacent rather than aggressive. 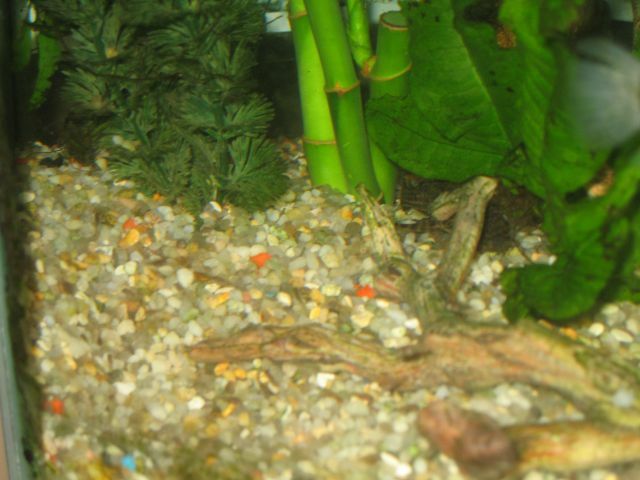 You can see him in the photos below. But instead of a kingdom ruled by a ruthless superfish, we have the devilfish acting like Wyatt Earp, with his deputies being the convicts. Everyone is getting along. 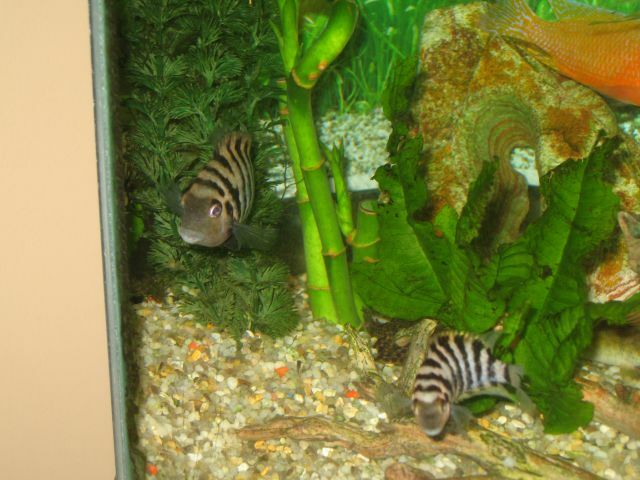 The biggest surprise was when we had two of the convicts pair off and start making a nest in the front of the tank. They would pick up a small stone with their mouths, and one stone at a time they would move it to the edge of this nest that they created. When the depression was large enough, they just hovered there for the best part of the day. Lo and behold, one morning several days later, we saw about forty baby convicts. 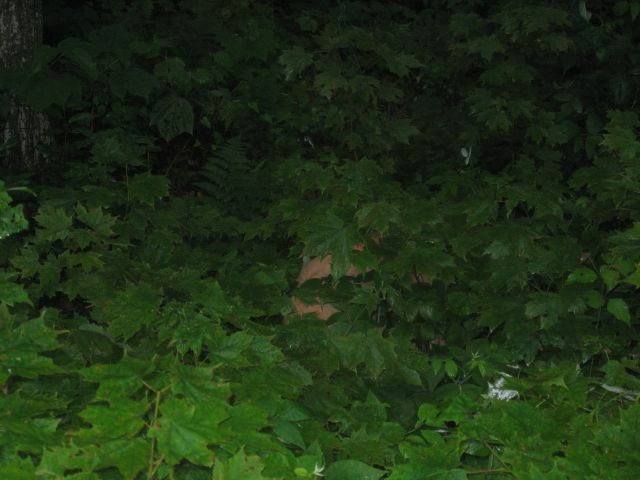 They were almost transparent at first and blended into the color of the stonebed. They all stay within this little circle around the nest, and they are guarded by either their mother or father. The mother is particularly alpha, she won’t let anyone big or little come close. 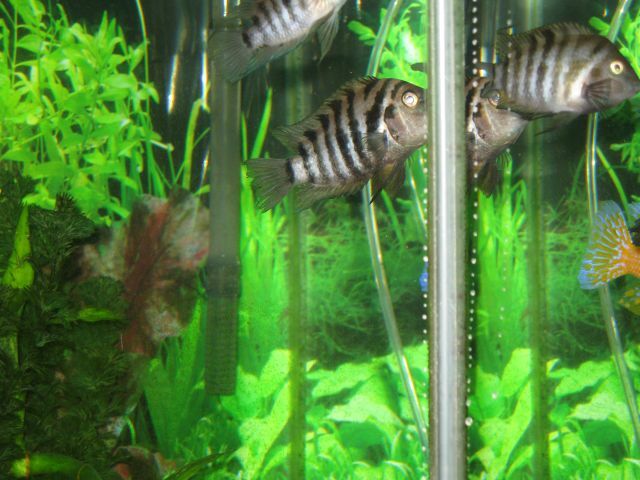 In fact, she forces most of the fish to stay in the back half of the tank. 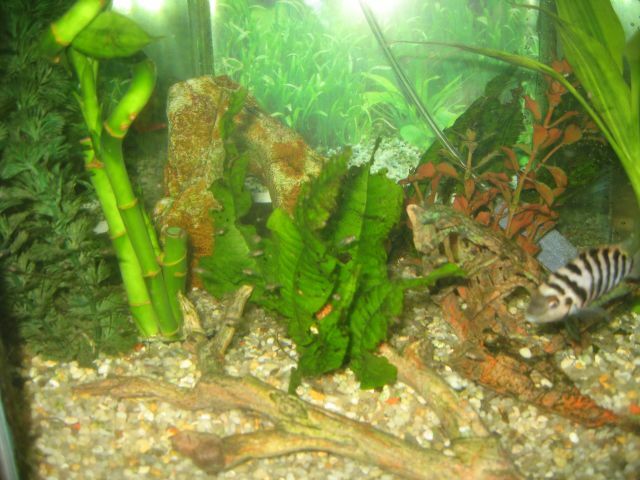 You can see them best against the green backdrop of the plants. It has been about two weeks since they were born and as best we can tell, none of them have been eaten. 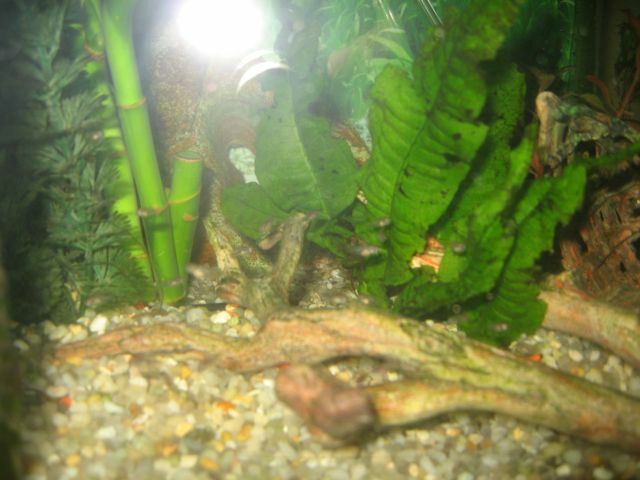 They are big enough now to be seen through the lens of the camera. So we now have a peaceful community where families are starting to be raised. Amazing. 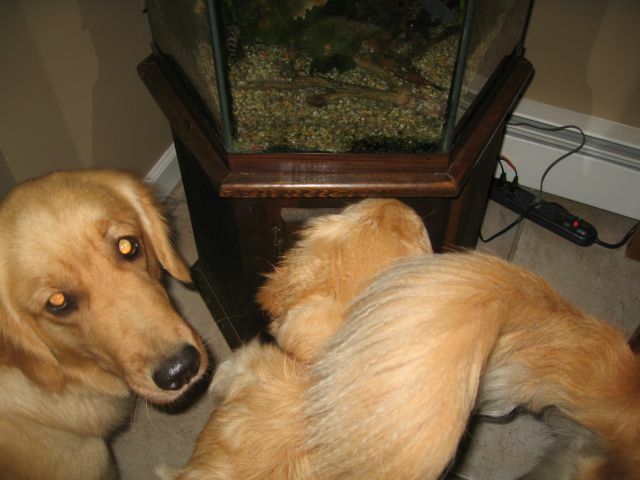 Of course our dogs have an interest in what is going on, but not in the way you would guess. 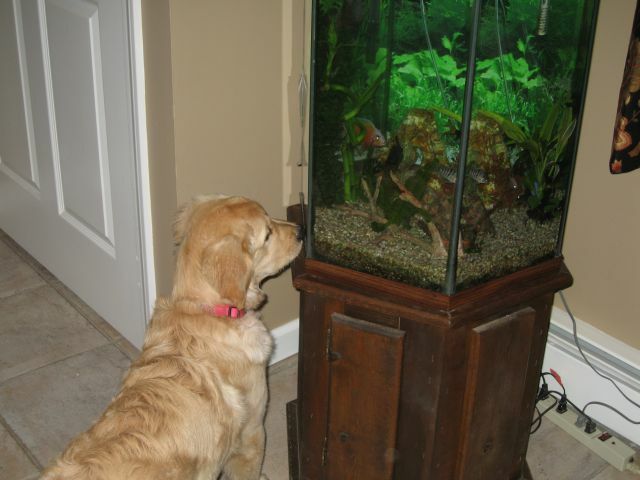 Although Lucy still likes to watch the colorful movement in the tank, the biggest draw for the rest is the taste of the fish food flakes that they all enjoy at feeding time. 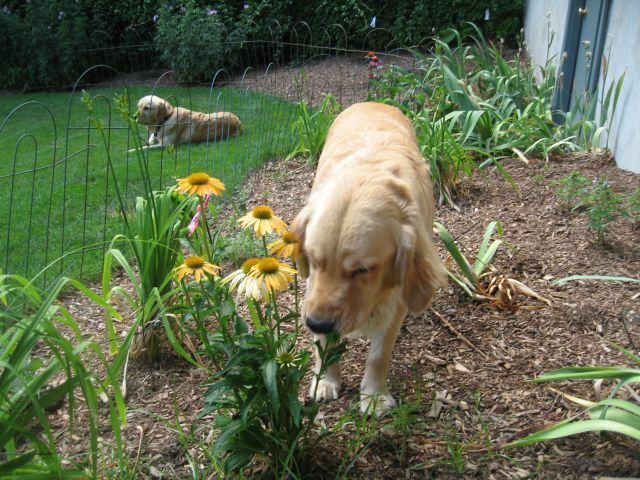 With the goldens being omnivores, there is very little that they don’t enjoy eating. The lesson here I think, is that life goes on in all planes, big and little, right under our noses all the time. And if you really think about it, our efforts at survival are not all that different from all the species of life around us. You just have to really look and pay attention. The dog days of summer are obviously here in force now. 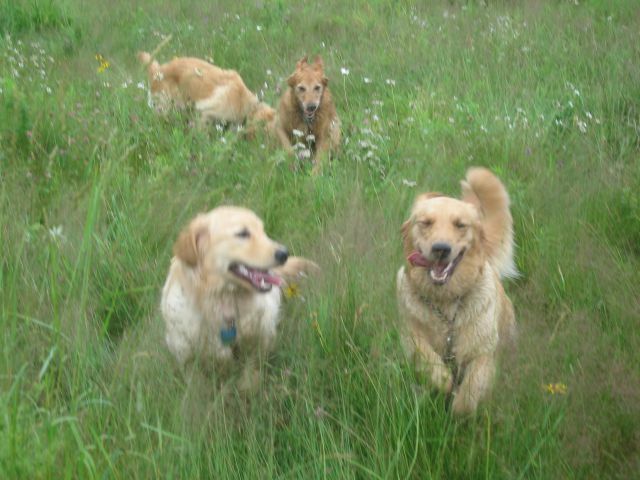 With their thick coats, our goldens get hot even with the early morning times for their exercise. 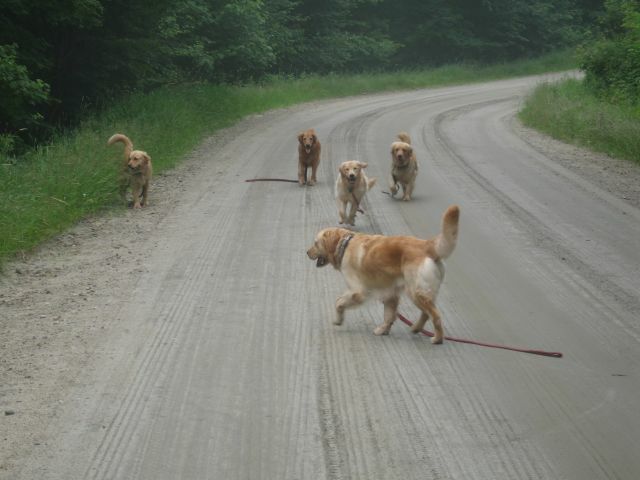 So they are very patient when we get back to the driveway. Each calmly waiting their turn for me to dry off their sweat, dirt, and excitement. After that is accomplished, they all get cool water to drink along with a small treat. 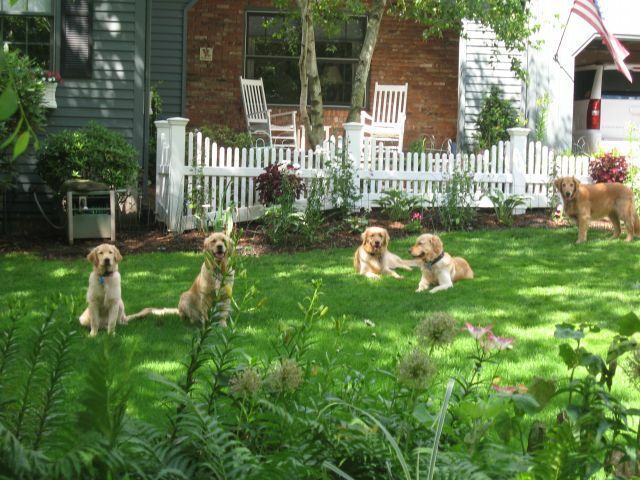 Then, after their cooling off period is over, they like to sit out in the front yard to watch the goings on in our neighborhood. On a recent pretty morning, I took these photos while I was working in the front flower bed. In the last photo, it looks like they have all directions covered. 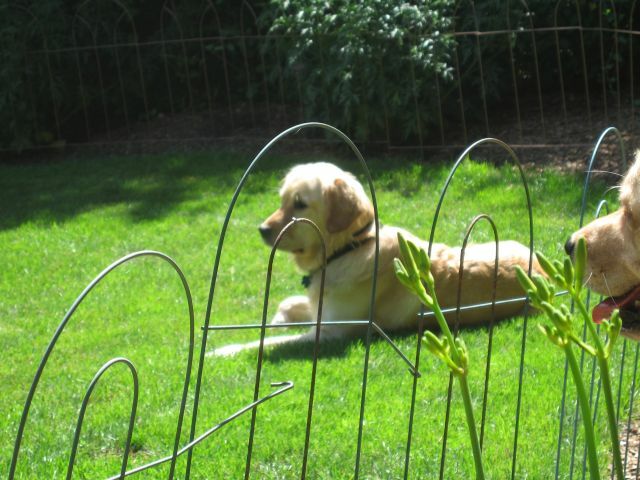 As soon as an animal, bird, dog or passerby is spotted, they gather at the edge of the invisible fence line and start up some noise until their territory is safe once again. Breeding News Update: We just got word that Riley’s sister is in heat. She lives with one of our breeder friends. So hopefully Riley herself will be following suit very soon. Next week we have an appointment to get Solo’s hips and elbows XRayed. This is the final clearance Solo needs to be a qualified mother. 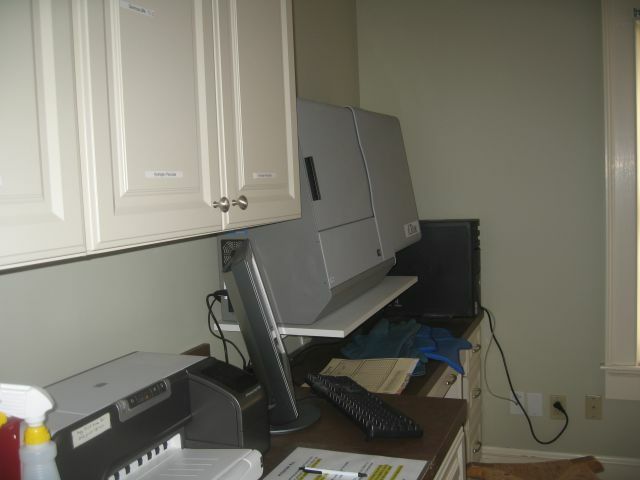 The results will take about two to three weeks to come back from the national clearinghouse center. Will keep everyone updated.